Jason Reeves Co-Writes Two Hits With Colbie Caillat, Releases Solo Album On Warner Bros. The ongoing phenomenon of Colbie Caillat’s debut album Coco and its two hit singles ‘Bubbly’ and ‘Realize’ has provided a major boost for the solo career of singer/songwriter Jason Reeves, who co-wrote ten of the disc’s 12 songs. In August 2007, when Reeves released his latest album, The Magnificent Adventures of Heartache (the full title includes the addendum ‘And Other Frightening Tales’), it was a strictly self-distributed DIY affair which he sold via sites like iTunes and from his live gigs. Its sales on iTunes were impressive enough for the site to name it one of the Top Folk Albums of 2007, and Reeves also earned distinction as one of iTunes’ Top Indie Singer/Songwriters. Early this year, Warner Bros. Records signed Reeves, and the label is making his album physically and commercially available on a grand scale for the first time. Even before striking platinum with Caillat, the 23-year-old Reeves had built an small but popular and critically-acclaimed catalog of independent releases which he recorded in his home state of Iowa long before making the move to Los Angeles; these include Makeshift Aircraft (2003) and The Nervous Mind of Love (2004). He was invited out to California to work on his subsequent EP Hearts Are Magnets with producer Mikal Blue, who thought he might have some things in common with his other charge, aspiring singer/songwriter Caillat. This casual introduction led to one of pop music’s most inspiring success stories of recent years, as Caillat parlayed her growing notoriety on MySpace into a major record deal with Universal Republic. Besides Coco’s success in the U.S. where it reached #5 on the Billboard 200, it has become a truly international hit, charting in France, The Netherlands, Germany, Switzerland, Greece, Portugal, New Zealand, Australia and Brazil. Caillat’s breakthrough single ‘Bubbly,’ whose video has been viewed on YouTube over 22.5 million times, hit #5 on the Billboard Hot 100, and #1 on Hot AC, AC and AAA charts. It also went Top 10 in nearly 20 countries worldwide. Reeves is a featured vocalist on the follow-up single ‘Realize,’ which reached the Top 20 on the pop chart and went Top 10 AC. Though they haven’t been released as singles, the informal videos for their songs ‘Droplets’ and ‘Permanent’ (featuring appearances by both Caillat and Reeves) are currently huge attractions on YouTube. 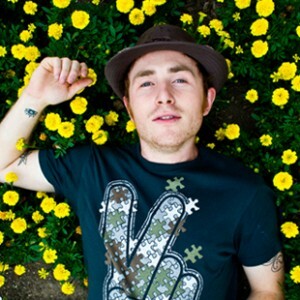 As a solo artist, Reeves boasts over five million plays on his MySpace page, and he was the site’s #1 unsigned folk artist for over nine months. The Magnificent Adventures of Heartache, which appropriately enough, Reeves calls a ‘musical fairy tale chronicling the many stages of a relationship,’ debuted at #2 on the iTunes folk chart. A longtime presence at Hollywood’s intimate taste-making club Hotel Café, Reeves’ three-piece band has toured this year opening for Caillat, Tyrone Wells and OneRepublic. He also headlined for the first time at the El Rey Theatre in Los Angeles. 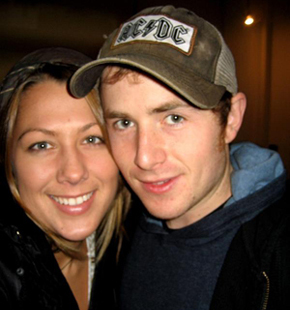 Jason Reeves with Colbie Caillat.